Flood models have been put forth based on theoretical explanations of the mechanism that were effective in producing the Biblical flood of Noah. Most theories suggest a possible source of the flood water that covered the Earth or the geological processes behind its subsequent recession. According to the Bible the flood of Noah was caused by a bursting of underground springs subterranean waters later accompanied by forty days of rain. It is largely presumed that the underground water was the principal supply of flood waters that covered the earth. The "springs of the great deep" mentioned in the passage above are believed to be a pre-flood subterranean water much like those that still exist today in remnant form. 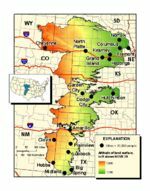 Unknown to many, much of the land under our feet resides upon massive bodies of water such as the Ogallala aquifer. The Ogallala Aquifer resides under several states in the US, and supplies continuous spring water such as the famous Artesian Wells (et al. Geysers). Even though these aquifers are largely depleted, today 40% of the drinking water in the United States comes from these ancient ground waters. Another massive body of water under the Asian continent is thought to be larger than the Arctic Ocean. Other studies reveal that there may actually be far more subterranean water than all of the world's oceans combined. The flood possibly began when the earth's crust was fractured releasing subterranean caverns of water and magma. The earth now exists as a mass of plates, which may not have existed until the crust was intentionally broken by God releasing the subterranean water. The canopy theory proposes that the floodgates of the heavens from the passage below was the primary source of the flood waters. The waters are believed to have been held in the form of a canopy of vapor or solid state matter high in the upper atmosphere. The canopy was formed during the the creation week and was destroyed at the time of the flood. 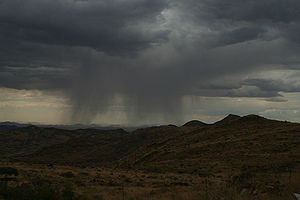 The 40 days of rain were the result of condensation of the water vapor into liquid rain water. The amount of water vapor was to supply enough water to cover the mountains by 15 cubits of water. It is believed that this canopy provided the protection before the flood enabling the long lifespans before the flood. 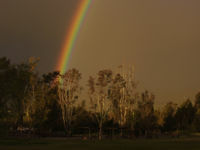 Others factors, such as the post-flood rainbow are pointed to that suggest significant change in our atmosphere took place as a result of this catastrophe. This theory has fallen into disfavor for an assortment of reasons that are explained in the main article of canopy theory. Not the least of these is the latent heat of condensation and the need to dissipate the heat to space in a short time. The hydroplate theory postulates that all land masses were positioned upon vast aquifers at the beginning of creation. It is believed these massive bodies of water were triggered to "burst-forth" and flood the earth. This theory has gained much credibility within the creation community due to the efforts of Walt Brown and his book titled In the Beginning. In a series of interconnected subterranean chambers below the crust of the earth existed a layer of highly pressurized water. 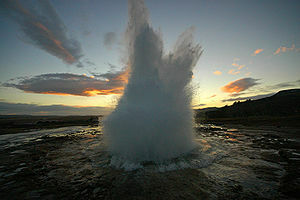 At the time of the flood, these waters broke through the crust as high pressure, hot geysers high above the atmosphere. The crust of the earth split apart forming the continental arrangement we have now. The Atlantic Ocean floor rose and on the opposite side of the earth the crust sank forming the Pacific Ocean. The area just over the Marianas Trench is a gravity anomaly of missing mass more so than expected if the trench were filled. Where the continent shelves on each side of the Atlantic do not line up for a "fit", both continental shelves line up to the Mid-Atlantic Ridge, where Brown purports that the initial crustal upheaval split the crust in a North/South direction. While it is a fairly popular theory, it does not find much support among creationary geologists. Catastrophic Plate Tectonics (CPT) shares some ideas of plate tectonics, but on a much faster scale. During the flood the viscosity of the mantle become reduced by several magnitudes causing pre-flood oceanic plates to sink into the deep mantle. This set up currents in mantle which broke apart former continental land masses and drug them across the surface of the earth. The former oceanic plate masses would stop sinking upon reaching the bottom of the mantle. The viscosity of the mantle would revert to normal, mantle currents would stop moving and the continents would come to a stop. This violent activity would cause massive tsunami flooding. Steam jets from high temperature exposed mantle would rise above the atmosphere. Condensed water vapor would rain on the planet. The newly exposed oceanic floors would be at higher elevations, flooding the continents. This is a popular theory among creationary scientists and geologists, but it has its critics and problem. The removal of heat created by the process, as with all flood models, remains a problem. The Flood account depicts the calendar as 12 months of 30 days or 360 days. While the resurfacing of the Earth can account for the globe achieving additional spin (for a 365 day year), it does not account for the Moon's current orbit of slightly less than 30 days. Moreover, the Moon is receding from the Earth at the rate of 1/2 inch per year, leading to speculation that prior to the Flood, something struck the Moon or drew it closer to the Earth. Its extra gravitational drag then initiated the Earth's crustal upheaval. God has demonstrated in many cases (including the Flood) that He would use natural forces to affect His miracles (e.g. strong East wind to blow back the Red Sea). Using the Moon in this manner is purely speculation, but elicits insight as to why its revolution is shorter than what is recorded in the Flood account. In 1998, just 4 years after Comet Shoemaker-Levi 9 impacted Jupiter, the Asteroid Impact model was introduce at the 4th International Conference on Creation. This model takes into consideration the 170+ impact craters of all sizes that exist throughout the flood's geologic record. These impacts during the year long flood represent an unprecedented and massive amount of asteroid impact activity. The largest asteroid impact alone could have caused, magnitude 11 earthquakes, 3 km high tsunami, global torrential rains, mega-hurricane winds, and global winter. The combined effect of all the known impacts would be of a cataclysmic catastrophe scale. It is estimated that actual number of asteroid impacts during the flood could have exceed 1000. This theory proposes that the surface waters of the globe found in Oceans, Seas and other bodies of water are the source for impact-tsunami flooding of continents resulting from asteroid impacts. Asteroid impacts would also eject massive amounts of liquid and vapor water into and above the atmosphere which would then return as catastrophic rains. The vast amount of energy injected into the planet by the impacts is suggested to have also triggered Catastrophic Plate Tectonics. This model has some problems, such as the removal of generated heat, but is generally too new to be well discussed. In 1696, William Whiston published A New Theory of the Earth, in which he proposed an account of the creation of the world. Whiston was the first to propose that the global flood was caused by the water in the tail of a comet. Close-up photography of comets in recent years have revealed that no water ice exists on cometary bodies. Rather they are hard, dark and chiseled surfaces, setting aside the prior speculations of comets as "dirty snowballs". Their tails formation have been re-characterized as the result of sublimation of their surfaces into a large trail of fine particles. Water also exists in the upper parts of the mantle. Science has found that a mineral called wadsleyite that contains enough water to fill 30 of our oceans. This is more than enough to flood the earth to the highest mountain. Instead of triggering catastrophic plate tectonics, asteroid impact is suggested to have caused local to regional vertical depression of the crust. Thus large areas would be be flooded due to differences in elevation. This model, known as vertical plate tectonics is also, very new. It too must deal with removal of excess heat and provide good explanation of more geologic features of the earth. ↑ Spencer, Wayne, 1998, Geophysical Effects of Impacts during the Genesis Flood, ICC Proceedings, p.9 "The large amounts of water vapor ejected into the atmosphere by impacts would clearly contribute to the rains during the Flood"
This page was last modified on 15 March 2014, at 22:02.